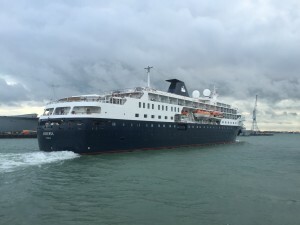 Stevedoring and ancillary services company Southern Maritime Services (SMS) has handled the first of 36 cruise ship call expected at Portsmouth International Port (PIP) this year following the arrival of Swan Hellenic’s Minerva. More than 190 passengers joined the luxury small cruise ship as she sailed on a 13-day trip to the Channel Islands and the North and West coasts of France. Besides manning the passenger reception desk, SMS also provided stevedoring baggage services and loaded several tonnes of food and other ship’s stores as Minerva made the first of nine calls scheduled for PIP this year. In addition, SMS’ sister company, Cruise and Passenger Services (CPS), provided valet car parking services for passengers joining the ship.